水木しげる (Shigeru Mizuki), the author of “Ge-Ge-Ge-No-Kitaro” (an anime about monsters that I like), has died today. Shigeru Mizuki (1922 Mar 8 – 2015 Nov 30) with two of his most famous characters. I wrote a post about his interesting life story on his 88th birthday (Click here to read it). Book review & giveaway 4: Yokai Attack! This is the fourth in my series of book reviews from Tuttle Publishers. And, just as with the previous three, the publishers will be giving (gave) away a free copy of this book to a random visitor of my blog. The details of the giveaway will be at the end of this post. The book that I’m reviewing this time is titled: “Yokai Attack! The Japanese Monster Survival Guide” by Hiroko Yoda and Matt Alt. What are “yokai“? In Japanese, “yokai” is written as 「妖怪」 and it’s the word for Japanese monsters or ghouls. I have been interested in monsters since I was a young kid…and when I came to Japan I got interested in Japanese yokai. So, of course, I was happy to get this book! And it did not disappoint me! The wonderful book is perfect for anyone interested in monsters, Japanese culture, or folktales (especially Japanese ones). I’m interested in all of those…so I like this book a lot! Before I read this book I already knew about a number of Japanese yokai…but this book is comprehensive. I even learned something about yokai that I knew well. There are 49 Japanese monsters introduced in “Yokai Attack! The Japanese Monster Survival Guide“. The book describes each yokai’s physical appearance and explains the meaning of its name, its strengths and weakness, and how to survived an encounter with one. Nearly every page has wonderful illustrations by Tatsuya Morino. “Yokai Attack! The Japanese Monster Survival Guide” can purchased here. As I mentioned above though, Tuttle Publishing has kindly agreed to give (given) one random visitor to my blog a free copy of this book. To enter in the drawing simply fill out this form by Saturday, 2014 September 27th. This special promo ended on 2014 September 27th. One random winner was selected and contacted directly by Tuttle Publishers (via email) with the details about the free book. 永井一郎 (Ichiro Nagai), the Japanese voice actor who was the voice of Namihei Isono on the long-running Japanese cartoon 「サザエさん」 (“Sazae-san“), as well as Yoda in the Japanese-dubbed version of “Star Wars” and many other well-known characters has died yesterday at the age of 82. Sazae-san’s father, Namihei Isono. 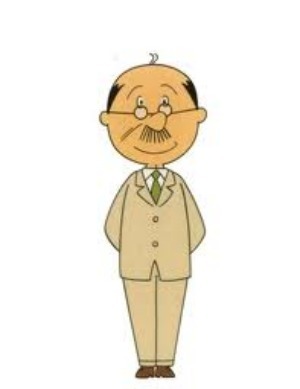 Mr. Nagai was the “voice” of this character for 45 years. 永井一郎 (Ichiro Nagai), 1931 May 10th – 2014 January 27th, R.I.P. The Japanese anime “Akira” predicted over 30 years ago that the 2020 Olympics would be hosted by Tokyo! In Tokyo, there are many kinds of theme cafes, restaurants and bars! Prison restaurants, robot restaurants, maid cafes, butler cafes, vampire cafes, cat cafes, dog cafes, turtle cafes, pop band cafes, Gundam cafe, and more! Once again, Pepsi Japan is offering special collectors’ edition bottles and cans. Starting last October 23rd (2012), Pepsi Japan started selling 「エナジーコーラ」 (“Energy Cola”) for a limited time in cans with an image of fire and Darth Vader from the Star Wars movies. Royal jelly, argenine, asian ginseng, guarana extract and caffeine. And in late November (2012), they began offering their NEX cola in bottles with images from the Japanese マンガ (manga comics) called “One Piece“.